At g.Vino I said I’d like a bottle of Mtsvane, and was given a taster of Chona’s Marani Mtsvane 2016. Mtsvane simply means green, and actually there are a few different Mtsvane varieties in Georgia, the most common one coming from Kakheti, where Chona’s Marani is located. So this was the Kakhetian Mtsvane – Mtsvane Kakhuri in Georgian – which is what I am used to drinking. But this was different. I was expecting something bright, lively, phenolic, astringent and aromatic, but this was more soft and gentle. Its appearance was not pretty – a cloudy muddy brown colour, depicted well in the image above. But I was not planning to sit and look at it all evening, and the nose was a lot more attractive – intense, fresh, fruity and spicy – and on the palate it had moderate amounts of acidity and tannin, giving that lip-smacking quality that works so well with food, without being too dominant. On the palate I noticed a slight lactic character, which also tended to give it a more rounded impression. Overall I liked it a lot (*****), so we took the rest of the bottle for 50 GEL. As far as I can tell it is not available in the UK, but if it was I guess it would retail for around £20 – the price most Georgian natural qvervi wines seem to sell for. 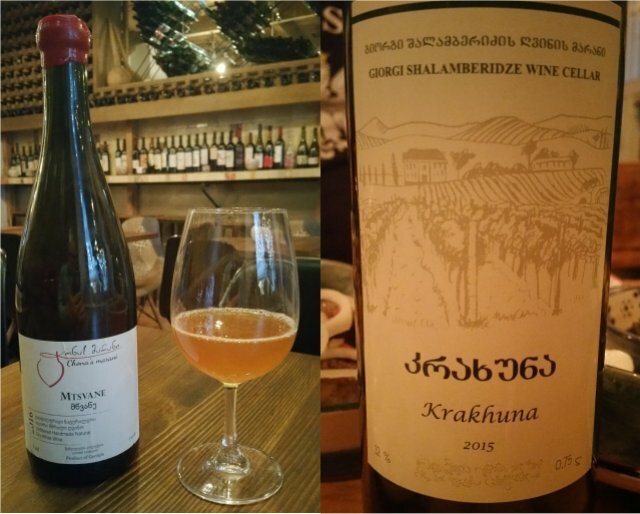 The wine we were offered at Sapere was the Giorgi Shalamberidze Wine Cellar Krakhuna 2015. According to the back label, it comes from the “Zestafoni district of Imereti, in the village of Tskhratskaro”, but that is pretty much all I can find out about the producer. Krakhuna is the grape variety, which I had not tasted before, but this wine was one of two really stunningly good examples we came across on the trip. It was pale gold, with an intense nose – honeyed and mildly spiced. Immediately after opening it was very slightly fizzy. There was a slightly off dry effect on the palate, which together with the honey on the nose could indicate a small amount of botrytis. Sadly, I realise this tasting note fails to explain why, but the wine was absolutely delicious. It hit the spot, and I gave it a doubtless hyperbolic ******. You had to be there to understand! This entry was posted in My tasting notes and tagged georgia, natural, qvevri, travel. Bookmark the permalink.